Centument LTD Software is a Scam - Don't Sign Up! Before you sign up for Centument binary software, take a minute to read this review before you throw your hard-earned money away. Do not sign up, as Centument LTD Software is a scam. Read our in-depth Centument review to find out the truth. Just like many other binary software scams out there, Gerald Reed, the alleged owner of Centument LTD starts off the sales video by flaunting his Lamborghini and his luxurious residence. Did you realize that Gerald kept changing spots throughout the video? There’s only one purpose behind this high exaggerated maneuver – it’s to feed your imaginations and get you hooked to the idea of becoming ultra-rich. Coupled with the actor’s professional appearance and use of multiple financial jargon, it’s not hard to imagine why many people fell into this scam. Once a potential victim is convinced by the video, everything else presented in the sales materials automatically become supporting facts that reinforce the credibility of Centument LTD Software scam. How do we know if Gerald Reed is telling the truth? There’s only one way to find out. Centument LTD scam is telling us quite a few blatant lies, and we’ve collected the proofs in the following section. 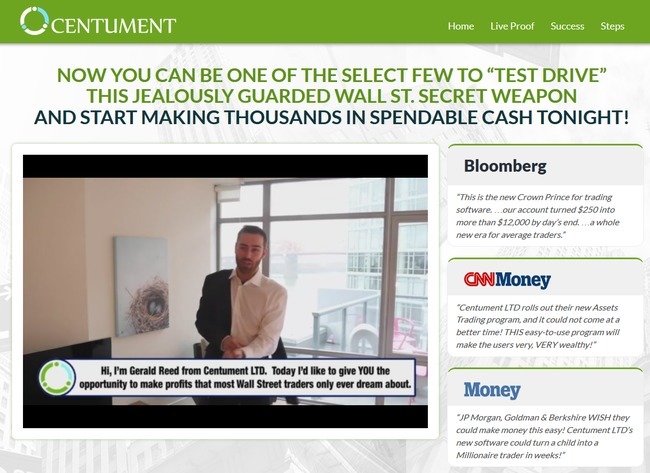 In the homepage of Centument scam, you can find the quotes about the company from several major financial websites. Gerald Reed even mentioned in the video that his software was featured in Bloomberg. It certainly doesn’t sound like the reporting style of a major financial website. 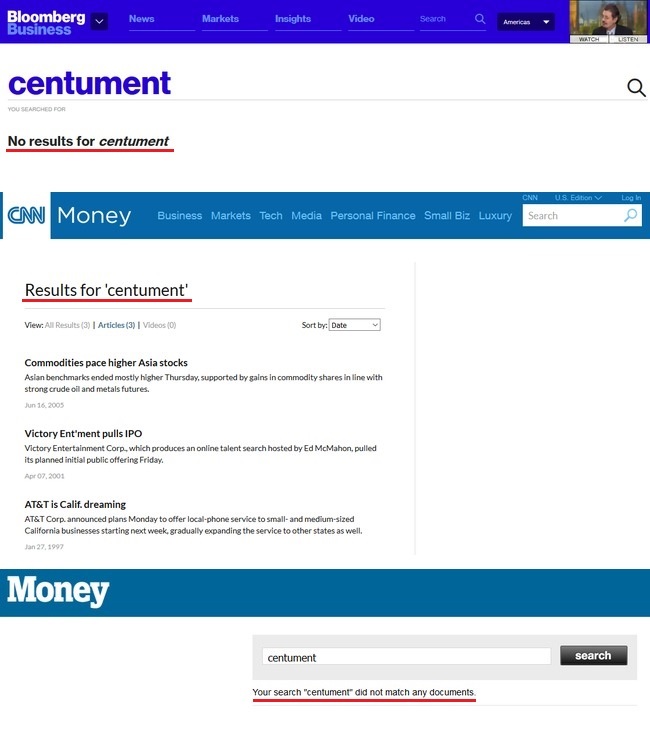 Anyway, we have searched for Centument’s presence in all 3 websites, and found that the term did not even appear in any article within the websites. These website has never mentioned Centument LTD or Gerald Reed before, simply because both Centument LTD and Gerald Reed do not exist. The quotes in the sales materials are fabricated only to promote this scam. Has Centument really been around for 4 years? This image was taken from the FAQ section of Centument LTD (Centument.com). According to their sales materials, Centument LTD was established in March 2011, and within 2 years it was achieving a net income of $304 million for its members. Sounds impressive, isn’t it? For a company of this magnitude, you would expect it to be registered and have its own website shortly after its establishment. Centument LTD Software needs a website to acquire their members from the internet, after all. However, an alarming truth can be found in the publicly available whois information of Centument.com. It shows that the company website was created just 2 weeks before this review, on 2016-01-06. What does it tell us? Centument.com is in fact a website and company fabricated just days ago, for the sole purpose of promoting the binary software scam. You may argue that the company has been around for a long, but the website was newly set up just to promote Centument LTD Assets Trading Software. Try to search around the internet for any other reliable information about the company. You will not find any official information about Centument and Gerald Reed. Not in Forbes, not in BBB, and certainly not in SEC government website. This company and this man can only be found within the sales materials of Centument LTD Software scam. Here’s more evidence to prove that Centument LTD Software is a scam. As with any other internet scams, you’ll find fake testimonials that give positive reviews to the scam, while showing their fabricated trade profits. 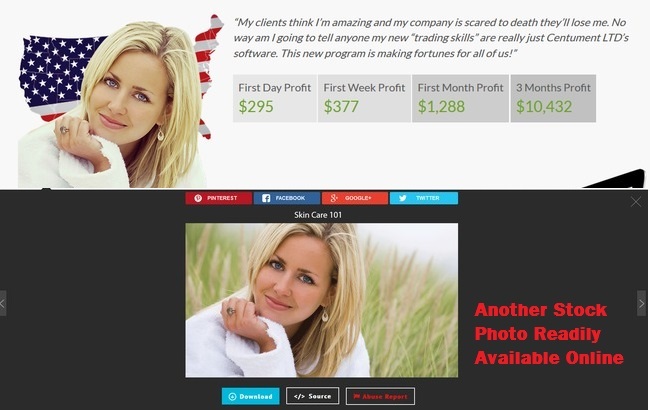 Sometimes the scam artists hire Fiverr actors to record fake video testimonials. 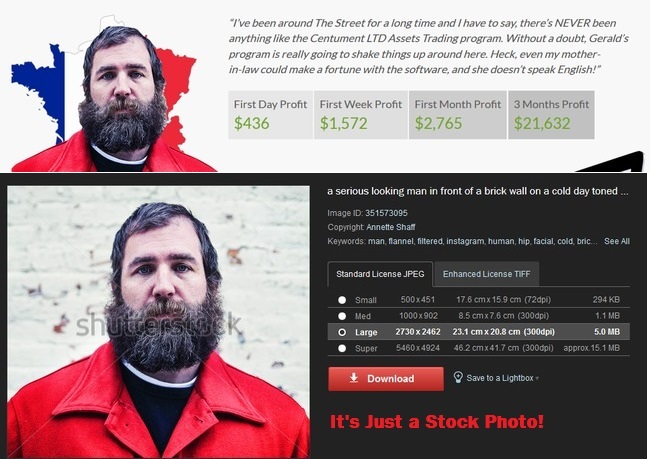 But in the case of Centument LTD Software scam, they use publicly available stock photos to fabricate testimonials and trading results. Apart from that, Reed also mentioned that the results of his Centument LTD Software are monitored by an independent 3rd party reviewer. However, he did not provide any proof for his/her existence, and any documents to support his claims. Why Are People Still Promoting Centument Scam? Now, this may not be the first review you’ve read about Centument scam, and you wonder why are there so many positive reviews out there if this product is a blatant scam. 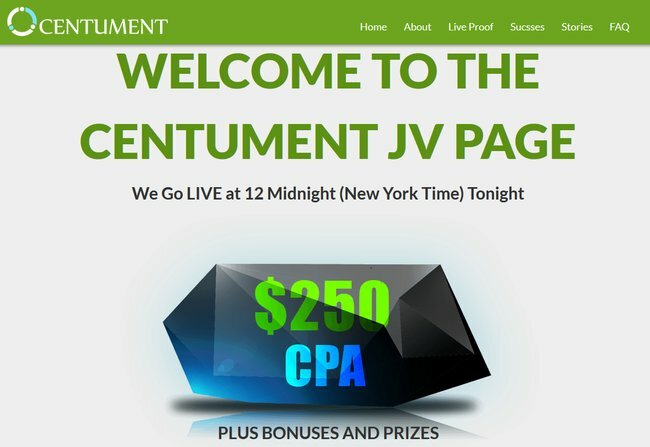 I could’ve written a raving review for Centument scam and encouraged my readers to sign up, and I’ll earn a nice $250 commission once they deposit into their trading accounts. In fact, it’s a lot easier to write than to look for evidences and expose this scam. However, I’ve been a victim of binary software scam before and I don’t want my readers to end up the same. If you really want to make money online, I’ll only recommend a legitimate business opportunity that I personally benefit from. It’s not a click-and-get-rich software, because such thing simply doesn’t exist. You need to put in time and effort to make money online. If you decide to sign up for Centument LTD Assets Trading Software, you’ll have to register for a broker account through their sales page (which is an affiliate link). The scammers behind Centument scam will earn a sum of referral fees as soon as you make your first deposit. I was assigned to one of their affiliated brokers, 72Option. You need to deposit at least $250 with 72Option before you can start trading. The minimum deposit for other affiliated brokers may be slightly different. Even if you already have an existing trading account with their affiliated broker, you have to register for a brand new account using a different email address. Why? Because the scammers behind Centument scam cannot earn their referral fees unless you sign up for a new account through their affiliate link. Not only that, Centument scam will continue to make money off you over the long term. The team behind Centument will earn commission for every trade that their automated software makes for you. To make things worse, since Centument LTD Software runs completely on autopilot, they can dictate your trading frequency and the trade amounts. In short, they can decide how much commissions to earn off you, as long as you still have money in your trading account. The scammers behind Centument will profit regardless of whether you make or lose money using their automated software. Is Centument LTD Software a Scam? YES, CENTUMENT LTD SOFTWARE IS A SCAM. Binary options trading is not that different from gambling, and using an automated trading software is no different. You are essentially putting your hopes and entire investment in a piece of software that gambles on your behalf. Gerald Reed is a phoney. a CON ARTIST & Scammer — He is waiter / actor who lives in a studio apartment in New Jersey. TOTAL LOSER!!!!! THE COMPANY IS A FAKE AS WELL. sORRY IF YOU WERE STUPID ENOUGH TO INVEST. DON;T BE STUPID AND FAIL FOR QUICK RICH FROM SLICK COMMERCIALS ! I just signed up with centument. I cannot even log in. I just got a call from a guy that sounded like he was from Boston and he wanted me to give him another $2700 to ensure that I make $10000 by the end of the week. I didn’t fall for that but unfortunately I think I may have lost $250 for the sign up. The call you received was from the sales manager of your broker. It’s a good thing u didn’t fund another $2700, it would’ve vanished, too. I think it’ll be hard to get back your money from these scammers, as I’ve had similar experience before and couldn’t get back my deposits. The best you can do is to count your losses and move on to a better platform. You might be interested in Wealthy Affiliate platform as I’ve reviewed in this site. I feel lucky to fist check with you guys before i Sign Up with Centument … Scammers. Glad the review helped, stay safe! Hi Dace, if they call you up be firm and refuse to fund your account. The broker needs your permission before they can deduct your fund. With that said, you have to be careful with shady brokers. Monitor your account for the next 1 month for any unauthorized deductions. If there is, call up the broker and request for a withdrawal. Don’t accept any trading bonus they might offer, or you have to complete a number of trades before you can withdraw. By that time you would’ve lost your funds. Well, I’m still trying to get my REFUND of $300 from Bloombex-Options. I sent in all of the necessary documents that they asked for Monday, Feb.8th. I called as soon as I sent them, and they said that they had received them, but that my broker wasn’t there. They assured me that I would get my REFUND in 7-10 days. My broker leaves a message on my phone, saying that he needs to talk to me, and that I need to send the documents that they had asked for. This was on Thursday, Feb.11th. Suddenly my documents had disappeared. I’ve tried calling him several times, and sending emails, and cannot get any response. Of course, keep in mind, they tell you that they don’t work on Friday. If anyone on this site has any suggestions, I would be very grateful. I think I said it earlier, don’t use Bloombex-Options, whatever you do. I don’t want anyone to go through what I have with them. I would love to find a safe and secure way of making money on line. This ordeal has pretty well taught me not to go with binary options. I wanted to try another one, but now I’m scared to. Good Luck to anyone else who is having problems. I was a victim of a few binary trading software scams before, and long story short – stay away from binary options unless you are a trading expert yourself. Don’t trust the trading robots. If you want to make money online, learn the proper skills because there’s just no free lunch in the world. I’m sure you have what it takes to become successful online, Lori. Imagine you owned a binary brokerage,or any other broker age for that matter. Would you sign up to lose a million (or whatever) dollars a day? Centument claims that there is a 60 day money back guarantee. I read where Rick lost his full investment in one day. I lost my $300 in one day, because they put me with Bloombex-Options. People need to be aware that they are not a trustworthy broker. I understand what Rick said about BOWD too. He promotes this product, and supposedly he says that he will try and help people get their money back when something like this happens. All he said to me was why did I pick Bloombex-Options, knowing that have no say so in who their broker is. He told me that there was nothing that he could do for me. REALLY? I’m done with him. Rick, you and I are in our 60 days, but I can’t find Centument’s 24/7 customer service number. Bloombex-Options told me that I have to talk to them about my REFUND. If you find a phone number for them, I would appreciate if you would let me know what it is. You can put it on this site. But like I said you have 60 days to get your money back. I’m not going to give up. I’m going to get my money back some how. GOOD LUCK to you Rick. Good luck to you too! I hope you can somehow get a refund from the scammers. It’s hard to find a customer service number of Centument because there might not be a service team at all. Sorry that I’m unable to help you more on this. But do update us if you make any progress with the refund. It might help other victims who come across this review. Sure, do check out my recommendation if you want to learn the proper way to make money online. Well, unfortunately I didn’t read this review in time. Instead I trusted the guys at binaryoptionswatchdog who gave it a glowing review. I signed up for centument this morning, deposited the $250, turned on the auto trade on low risk (1 trade at a time – $25), and within 10 minutes the software spent the entire $250. That’s very unfortunate indeed. Sadly, too many reviewers are tempted by the commissions and choose to endorse this scam. The same goes for Virtnex scam. Well, I’ve also been scammed multiple times before I finally found the legitimate way to make money online. The best you can make out of this is to take it as a learning experience. Don’t fall into any other scams promising easy money. Try out my recommended business opportunity. It’s free to get started anyway, and you’ll gain so much out of it. I found the video to be the most laughable piece of crap yet. On a personal note I’ve been burned before by these binary option scams. Never again!. It boggles my mind how all these binary option trading scams are still being promoted when these scammers know that they have been exposed for what they are, thieves. The brokers involved in these scams are not licensed or registered, and that is a fact that anyone check. Unfortunately most of these scams are targeted at complete newbies who don’t have any experience with binary options, or trading in that matter. Most people aren’t aware of these scams until they are burned, just like us. OMG!! I was going to use it and you saved me! !